NEW! Coeur d'Alene Condo - 2 Mi to Beach & Lake! 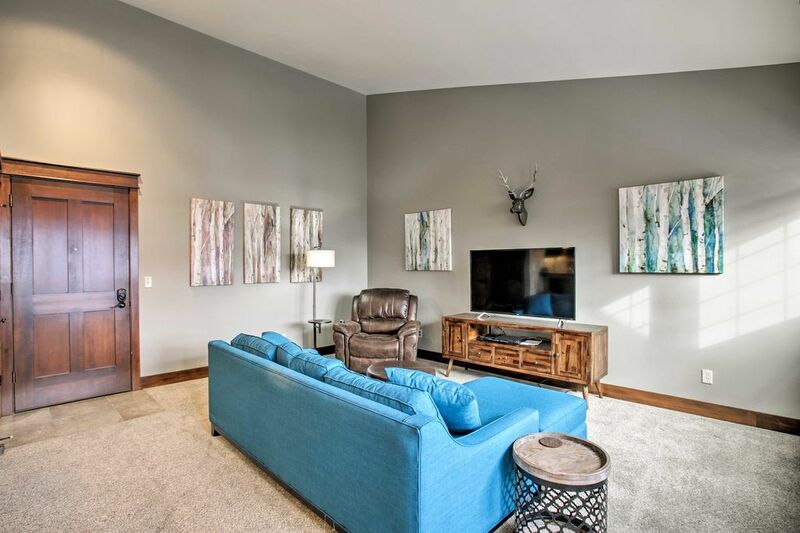 Stay at this Coeur d'Alene vacation rental condo located in the Village of Riverstone, an open-air lifestyle destination with dining, shopping, and a movie theater The home for 5 has 2 bedrooms and 1.5 bathrooms. The property boasts colorful paintings and modern decor inspired by the natural surroundings. Just a 2-minute walk from the Spokane River, enjoy strolls along the Centennial Trail, live music at City Park and Beach and Riverstone Park, and stunning views of the lake from Tubbs Hill. Start your morning with a hot cup of coffee best enjoyed in the fresh air on the patio. This condo is located in the Village at Riverstone and sits above a plethora of shops, restaurants, and attractions for you to explore. When you've had your fill of shopping and dining, head back home to relax in the living room. Collapse onto the vibrant sofa and watch a show on the flat-screen TV. Let your eyes wander across the beautiful and unique paintings hung through the space. As you grow hungry, make your way to the fully equipped kitchen. You'll find everything you need to prepare delicious home-cooked meals. Gather around the dining table with room for 6 and the breakfast bar with room for 2 and feast with your loved ones! Head to Couer d'Alene City Park and Beach, just 2 miles away. The spot offers sandy beaches, walking trails, and volleyball and basketball courts. During summer, enjoy listening to live music at the concert series as the kids have a grand time on the playground! Admire breathtaking views of Lake Coeur d'Alene from Tubbs Hill, about 3 miles from the condo. The waterfront park is comprised of 120 acres of native vegetation and an extensive network of hiking trails. A short walk away is the North Idaho Centennial Trail which winds along the Spokane River. Embark on a waterfront stroll or pack a picnic and make a pit stop at Riverstone Park where you can enjoy live music and admire the scenery.